You’ve Conducted a Survey…Now What? It’s a common practice to collect feedback from employees to gauge how things are going. Whether it is an employee opinion survey, an assessment of employee engagement, or a focus group/interview study, many organizations periodically ask employees for their thoughts and/or input. The hard part isn’t asking the questions or collecting the data. It’s what do you do once you have the information. Snowstorms…spring thaw…freezing rain. Huge fluctuations in weather are quite common in the Midwest. If you’ve lived or traveled in this area you are well accustomed to it. What struck me during a recent cold spell is how easy it is for some people to focus on the negative instead of appreciating what’s in front of them. 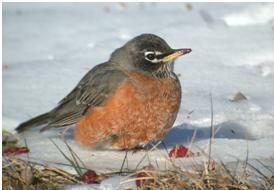 The robins are back—scratching for food through what remains of the winter snow. The crocuses and daffodils are poking their way out of the still frozen ground. Yet, what I’ve heard from a lot of people is the negative reaction to our slow turning spring (i.e., “I’m SO sick of winter”). While this is understandable as temperatures remain chilly, it prevents people from appreciating what is around them and recognizing the beauty that is at hand. For many, this time for reflection presents an opportunity to look ahead and think about what you can do to “make a difference” in the year to come. You’ve heard the phrase, “the devil is in the details.” The idea that the details are important—that whatever one does it should be done thoroughly. I’ve been knee deep in details of late. I am writing an e-book, Talent Management Toolkit. We want to provide a resource for small to mid-size organizations to help them with their talent management efforts since much of what is available focuses on large, global organizations. I spent a great deal of time pulling together the content, writing the various chapters and updating the tools and templates. However, now I’m in the detail stage. Editing, refining, setting up the associated web pages, marketing, etc. I have definitely been overwhelmed with the details. I dusted the cobwebs off of an old training maxim this week. I was coaching a leader who talked about the discomfort she was feeling while trying to implement some of the changes in her development plan. She shared that while she has increased her awareness, she doesn’t feel like she has been successful in changing her behavior. The following learning path came to mind. I remember using it years ago when I first started working in the area of OD and Learning and Development. It will be very familiar to many of you—hopefully, it is a good reminder. My guess is that for many individuals you work with it will create an ‘aha’ moment. It did for my client. I like to look for leadership everywhere. I talked about that in a previous post, Observe Leadership in Action. It might be evident on a sports team, in the board room, or at a neighborhood gathering. Leaders and leadership traits emerge all the time; and, we can learn from those around us on a daily basis. This past weekend I learned about leadership past and present. I had the privilege of accompanying the Badger Honor Flight to Washington D.C. Eighty-seven veterans flew from Madison, Wisconsin to/from Washington DC to visit the war memorials. For many, summer means vacation season. It might include packing the bags and taking a holiday with the kids. Maybe it is as simple as kicking back with friends or enjoying an outdoor concert. Or, perhaps it is enjoying a variety of outdoor activities in order to benefit from the long summer days.